Dietmar W Hutmacher with students IHBI, Kelvin Grove. 3D printing never ceases to amaze- from 3D printing parts for aircraft to 3D printing food and all sorts of implants in medicine – this is the world we live in today and it’s pretty amazing. A combination of regeneration and chemotherapy is the latest weapon prepared for use in the fight against breast cancer – again, thanks to 3D printing. 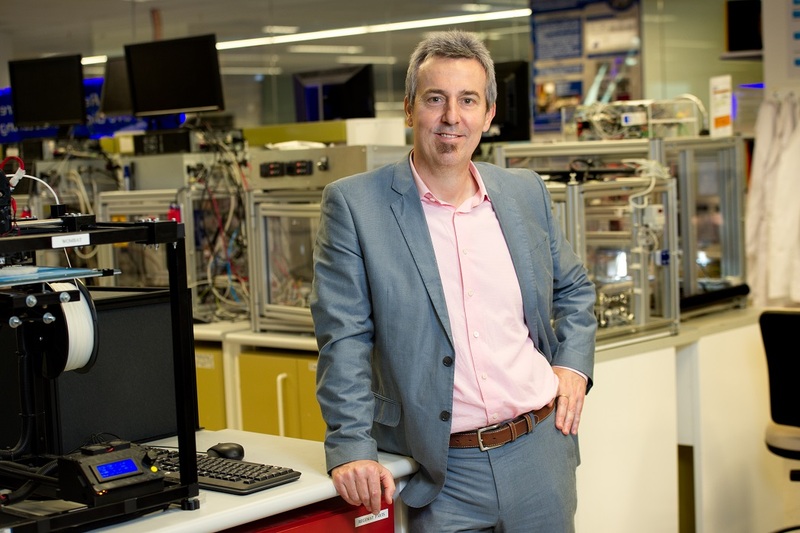 QUT’s Distinguished Professor Dietmar W Hutmacher has been awarded a grant under the Advance Queensland program to develop biomaterial (bioink) software and hardware which will enable surgeons to use patient-specific 3D printed implants that will deliver life-saving treatment for patients. These implants – a highly porous, light-weight biodegradable scaffold 3D printed with a biodegradable polymer – will contain anti-cancer chemotherapy intended for implantation after mastectomy and will be combined with the patient’s own fat tissue. “The chemotherapy drugs on the surface of the scaffold allow drugs to be delivered to the cancer site instead of the whole body as is the current practice,” said Professor Hutmacher. His team includes bioimaging specialists, TRI director and QUT Professor Carolyn Mountford, breast surgeons Professor Owen Ung and Dr Clement Wong and two industry partners, spin-off company Biofabrication Design Solutions (BDS), and 3D Industries. “The rapid advances of translational research in tissue engineering have started a new era in personalised medicine. Regenerative medicine will grow as more individualised medicine paradigms to create predictive, personalised, and pre-emptive solutions for tailored delivery of patient-specific healthcare,” added Professor Hutmacher.